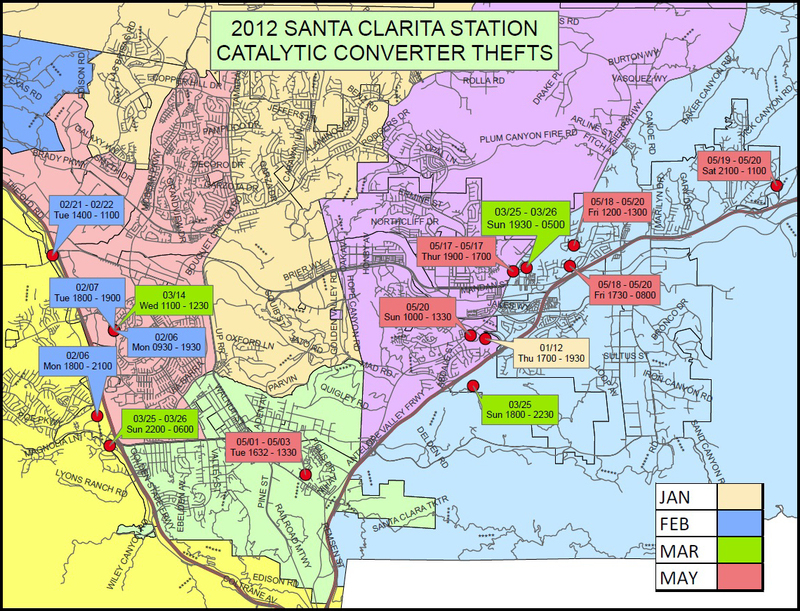 [LASD] – The Santa Clarita Valley Sheriff’s Station’s Crime Prevention Unit and Crime Analyst have identified several sporadic incidents of catalytic converter thefts occurring in many zones throughout the Santa Clarita Valley. Dating back to January 2012, there have been 15 reported incidents as outlined in the attached map. Zone 3 Stevenson Ranch, Zone 5 Valencia, Zone 7 Canyon Country West and Zone 8 Canyon Country East have been the areas most affected. Fourteen of the fifteen incidents involved Toyota vehicles – usually Tacoma, Tundra, and 4-Runner models. Seven of the incidents have occurred in he month of May, with six in the Canyon Country area and one in Newhall. Three of the incidents have occurred during daytime hours in the College of the Canyons parking lot. Deputies believe the recent thefts may be being perpetrated by the same individual(s). Crime prevention deputies are asking all Santa Clarita Valley residents, especially those who drive the indicated vehicles, to keep a close eye on their neighborhoods and vehicles. Residents should look for people working on vehicles at odd times or locations, loitering around them with no apparent purposes, possessing tools or saws, or crawling underneath the vehicles. Another indicator may be a second person sitting in a separate vehicle nearby with no apparent purpose acting as a look out. Immediately report any suspicious activity or persons to the Santa Clarita Valley Sheriff’s Station. It seems these thieves are targeting these trucks because they are higher off the ground and easier to access. Residents can take other precautions, such as parking vehicles in a garage or a well-lighted areas, listening and reacting to sounds coming from the street in the middle of the night and dogs barking excessively for no apparent reason and immediately calling the Santa Clarita Valley Sheriff’s Station with specific information. Be a good witness and get license plate numbers or take a cell phone picture when safely possible. To report crime tips anonymously, call “LA Crime Stoppers” by dialing 800-222-TIPS (8477), texting the letters TIPLA plus your tip to CRIMES (274637), or using the website http://lacrimestoppers.org.